It's a sad fact of life that a semi-engaged mass-market audience is preferable to a fiercely-devoted small one. 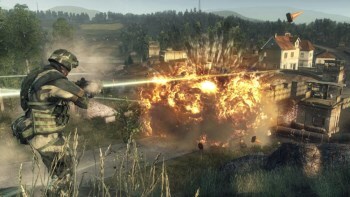 It's a microcosm of the videogame industry: DICE would "love" to make a new Battlefield: Bad Company game, Executive Producer Patrick Bach told OXM, but Electronic Arts is iffy on the idea and thus it's not likely to happen. The problem isn't that Bad Company is a bad game, but that its oddball humor limits its appeal. "It is a discussion about niche and mass market, I think. If you make your product more niche, you'll get more happy fans, but that audience will be smaller - some people won't care, some people will love it," Bach said. "When we did the original Bad Company and the sequel, we got a lot of criticism. Why would I play this? It's not a serious shooter, I don't care about this. I want a serious shooter with a more hard-boiled angle. And we thought it was fun! We loved it, we thought it was a great game. The narrative was amazing and the characters were amazing." "So it's not that we've buried the crew, so to speak," he continued. "But it is true that for some reason if you want to make a game for the masses, you need to be more neutral when it comes to things like humor, because humor is very personal. Some people love it, some people hate it." So there you have it. Entirely unsurprising - business is business, after all, and this is business - but it's still disappointing when it's spelled out so clearly. Dedicated audiences are lovely things to have but if they're not big enough to make to make a splash in the money pool, they don't really count for much.